The 70th Republic Day four-day long celebrations concluded on 29th January 2019 with 'Beating the Retreat' ceremony, which was held at the historic Vijay Chowk in New Delhi. 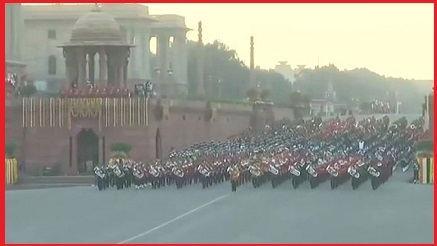 The Beating Retreat' marks a centuries-old military tradition, when the troops ceased fighting, sheathed their arms and withdrew from the battlefield and returned to the camps at sunset at the sounding of the Retreat. The ceremony began with the arrival of Indian President Ram Nath Kovind guarded by his well-decorated bodyguards. This year, Indian tunes were the flavour of ‘Beating the Retreat’ ceremony. The ceremony witnessed as many as 27 spectacular performances by the bands from the Army, the Navy, the Air Force and the State Police and Central Armed Police Force (CAPF). Out of the 27 performances, 19 tunes were composed by Indian musicians, which include Indian Star, Paharon ki Rani, Jai Janam Bhumi, Queen of Satpura, Vijay Bharat, Aakash Ganga, Gangotri, Namaste India, Samudrika, Jai Bharat, Young India, and Veerta Ki Misal. Eight western tunes such as Sound Barrie’, Twilight, Space Flight, Drummers Call were also a part of the ceremony. The event was brought to a close with the ever-popular tune of Sare Jahan se Acha. Overall this year, 15 Military Bands, 15 Pipes and Drums Bands from Regimental Centres and Battalions participated in the Beating Retreat ceremony. Besides this, one band each of the Indian Navy and Indian Air Force band and bands from the State Police and CAPF comprising Central Industrial Security Force, Central Reserve Police Force, and Delhi Police also took part in the ceremony.